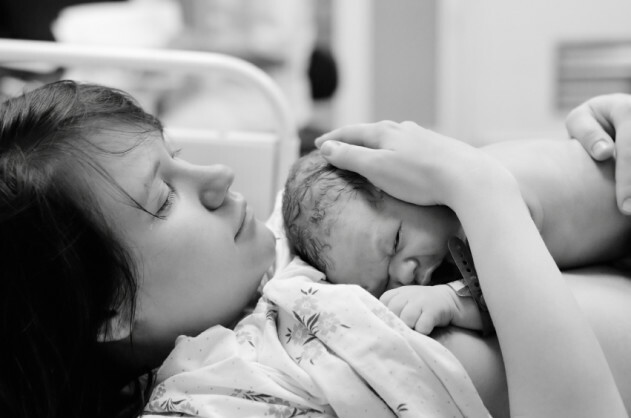 For many women, the magic of motherhood seems to sweep over them on the day their baby is born. For me, the magic of motherhood came like a change in seasons—gradually and quietly. In late December 2009, the month my oldest son was born, I was scrolling through the photos in my phone and kept going back to two key pictures. The first was taken in the early morning hours on the day of my son’s birth, with me standing in the hospital parking lot with my hand on my big belly, smiling big. You can almost feel my nervousness and excitement in that picture. The second picture is the first photo I took of my son, sometime late that night. He was swaddled and sleeping on my lap in my hospital bed. In between those two pictures, I became a mom and my life was changed forever. But instead of feeling like it was a magical transformation that occurred, looking at those two pictures left me feeling angry. I remembered the 18 or so hours between those two pictures. There were only two or three photos of me with my son on the day he was born, and I looked like someone who was hospitalized for a serious illness, not a woman who has just given birth to a miracle. I had checked into the hospital for a scheduled induction, and 12 long, painful hours later I consented to a Cesarean section. I was neither prepared for the Pitocin-induced contractions nor for a C-section, my first ever experience with surgery. I was a physical and emotional mess after my son was born—swollen, exhausted, and sore. Holding my baby many hours later—because he had been whisked away to be observed in the NICU after swallowing some meconium—I wanted to feel the joy of new motherhood. I wanted to be able to claim that this day, the day my first child was born, was the most magical day of my life. That was the way I was supposed to feel, right? That’s what nearly every mom I know had said. But being in a hospital bed, catheterized and with staples in my stomach, compounded by no food in nearly 24 hours and almost no sleep in almost twice that, plus breastfeeding difficulties that never improved, just left me feeling shell-shocked. I was witnessing everything from a distance, and I’m sure the pain medication I was getting only intensified the surrealness. The magic didn’t come for me on that first day of motherhood. It didn’t come three days later when I finally got to go home with my new baby. I’m not really sure when it came and I can’t say that I was even thinking about it. I had a new baby. He was beautiful and healthy and I was grateful for that, but there was no time for wondering why I didn’t feel overjoyed. My focus—my entire focus for weeks, maybe months—was on doing the best job I could as a new mom and not screwing it up. I would mutter to myself, “OK, you can do this. You can do this,” all the while wondering if I really could do it. My confidence was a long time coming, while I was constantly reminded of my inexperience and how far I had to go. It didn’t help that I went through those early months alone. My husband was in the Navy, and while he made it home for the birth, he returned to his command overseas two weeks after our son was born and didn’t come home until May, after my first Mother’s Day. Those first few months of motherhood are a blur of depression, exhaustion, and many moments of sheer terror as I went from someone who had never so much as changed a diaper to someone’s mother, who is wholly responsible for an infant. All the books and advice in the world hadn’t prepared me for that. The magic came, but it took time. I felt nothing but happiness in our new family when my baby laughed and I saw his father’s expression in his dimples, or when I’d Skype with my husband thousands of miles away and tell him about what new thing the baby had done that day. I was learning to be a mother, which brought the confidence and joy that had eluded me. For many women, the magic of motherhood seems to sweep over them on the day their baby is born—it is a beautiful, transformative tornado that catches and consumes them. For me, the magic of motherhood came like a change in seasons—gradually and quietly. I didn’t see it happen because I was too engrossed in doing it right. But one day I looked up and saw that my whole world had been changed. And it was beautiful. This originally appeared on Mom.Me. Republished here with author’s permission.